In a weird way, the Yankees trading for a big name reliever at the deadline was both surprising and not surprising. It was surprising because the bullpen was a strength pretty much all season, even with some hiccups along the way. It was not surprising because the Yankees clearly value a deep bullpen, and adding to a strength is never a bad thing. Another reliever just didn’t seem to be a priority. There was more to the Zach Britton trade that what met the eye, however. The bullpen was on shaky ground despite its overall effectiveness. Aroldis Chapman had pitched through a knee injury all season. Chad Green was not quite as dominant this year as last year, and he had some notable meltdowns at midseason. Dellin Betances has a history of losing effectiveness late in the season. The Yankees wanted some bullpen protection in case things went south — Chapman’s knee eventually sidelined him for a month in late August and early September — so, on July 25th, the Yanks sent three pitching prospects (Dillon Tate, Josh Rogers, Cody Carroll) to the Orioles for Britton. It was the first player-for-player Yankees-Orioles trade since the Jaret Wright-Chris Britton trade in November 2006. Britton’s (Zach, not Chris) time with the Yankees started slowly but he eventually settled in and became a key late-inning reliever who took a turn at closing while Chapman was sidelined. In 25 innings in pinstripes Britton had a 2.88 ERA (4.08 FIP) with less than stellar strikeout (19.8%) and walk (10.4%) rates, but a dominant ground ball rate (77.8%). Grounders are Britton’s thing. Time to review his partial season as a Yankee. Britton did not take the mound in an official game until May 30th this season. That was a High-A rehab game. Britton blew out his Achilles during an offseason workout last December and needed surgery. That delayed the start of his season and also left him looking a little rusty once he did return. He made five minor league rehab appearances before rejoining the Orioles in mid June. On June 12th, Britton made his MLB season debut in the seventh inning of a game the Orioles trailed by four. Hardly the glamour of a ninth inning save opportunity. He walked three of the five batters he faced but managed to throw a scoreless inning. It wasn’t until his sixth appearance that Britton saw a save chance — you can at least partly blame that on the O’s being so terrible and having so few save opportunities — and it wasn’t until July 9th and 10th, nearly a full month after he returned, that he pitched on back-to-back days. Prior to the trade Britton looked quite rusty, throwing 15.2 innings with a 3.45 ERA (4.44 FIP) and nearly as many walks (ten) as strikeouts (13) with the O’s. His 64.1% ground ball rate was a) very good compared to the league average, b) low for Britton, and c) accumulated in a very small sample. Britton didn’t look much like the guy who had a 0.54 ERA (1.94 FIP) in 2016. But the Yankees believed in his track record and saw enough to swing the trade. The first eight appearances of Britton’s 25-appearance stint as a Yankee (29 appearances when you include the postseason) did not go particularly well. He allowed six runs in 7.1 innings with walk trouble (six in those 7.1 innings) mostly to blame. Opponents hit .300/.447/.433 against him and that was all it took for the “terrible trade!” and “he can’t handle New York!” crowd to come out of the woodwork.
? Britton got three double play ground balls in that ninth inning and only one, the last one, was turned into outs. I know I wasn’t the only one expecting Britton to throw that final double play ball into center field given how the inning was going and the general shakiness of pitchers throwing the ball to second. Anyway, Britton allowed three hits in 9.2 innings in September — that worked out to a .088/.184/.088 opponent’s batting line — and the Yankees had used him in a variety of roles. He set up, he closed, and he entered games as early as the seventh inning. 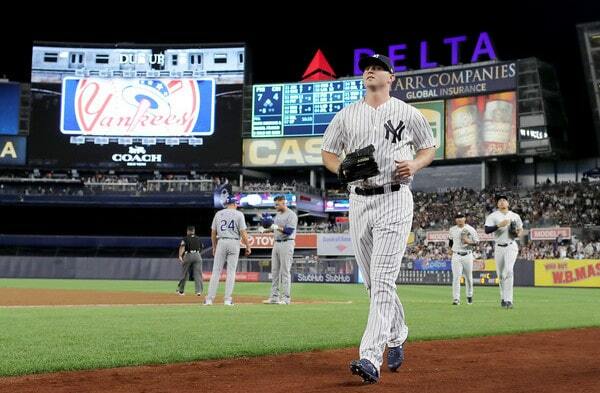 Britton said he was open to pitching in any role — “I spoke with Aaron (Boone) and I told him I’m ready for whatever situation he wants to use me in,” he said during his introductory press conference — and the Yankees did indeed take advantage of that willingness to pitch whenever. Britton saw a lot of action in the postseason — he appeared in four of the Yankees’ five postseason games (no other reliever pitched in more than three) — and he allowed three runs in five innings. Two of those three runs came on Khris Davis’ short porch two-run homer in the AL Wild Card Game, which merely turned a six-run lead into a four-run lead. If you’re going to give up a two-run homer in the postseason, that’s not the worst time to do it. “Arm-wise, I can’t tell you how great my arm feels compared to any other year since I’ve been in the majors,” said Britton the day before the AL Wild Card Game, referring to how the Achilles injury gave him time to rest his arm. The Yankees were banking on Britton getting back to his 2014-17 form as he got further way from the injury and that is pretty much exactly what happened. I mean, he wasn’t that good, but he was really good by the end of the season, after getting some innings under his belt. The trade accomplished two things. One, it gave the Yankees another high-end reliever. Hooray for that. And two, it helped clear up the 40-man roster situation. All three pitchers the Yankees sent the Orioles are Rule 5 Draft eligible this offseason and had to be added to the 40-man roster. In fact, a month before the trade I mentioned Tate and Rogers as potential candidates to be traded rather than be added to the 40-man. See? Sometimes I’m right.
? Rogers made five Triple-A starts after the trade before being summoned to Baltimore. He made three starts with the Orioles and allowed eleven runs in 11.2 innings. The O’s shut him down for workload reasons in mid September and, weirdly, they sent him home rather than let him travel with the team and soak in the big league experience the rest of the season. Huh. Usually teams want guys sitting in on meetings and whatnot. Whatever. As for Tate, the Orioles sent him to Double-A after the trade and he threw 40.2 innings with a 5.75 ERA (4.14 FIP). His strikeout rate went from 21.9% with the Yankees to 12.0% with the Orioles, and that’s at the same level and even in the same league. Tate still has development ahead of him and O’s might be the worst pitcher development organization in baseball. Poor kid. Baltimore did add him to the 40-man roster prior to the Rule 5 Draft protection deadline last week though. I imagine Tate’s going to Triple-A next year. Carroll and Rogers will probably get a chance to compete for big league jobs in camp. Back to Britton. He is a free agent this offseason — the Yankees could not make him the qualifying offer because he had been traded at midseason, though I reckon they would’ve made the offer if the rules allowed — and Britton said he would “love to be back” with the Yankees before the season even ended. Players come to the Yankees and they don’t want to leave. It has been a recurring theme the last few years. Britton turns 31 next month and he’s had some injury problems the last few years, so this might be his only chance to cash in big as a free agent. He banked over $33M in his four years of arbitration as a Super Two closer, so he’s not hurting for cash, but this is probably it. His best chance for a large contract. I don’t see him taking a one-year pillow contract to prove to teams he can still be effective across a full season, then testing free agency against next year a la Josh Donaldson. The Yankees are reportedly looking to add two relievers this winter and that makes sense given Britton’s and David Robertson’s free agencies. Britton is open to coming back and that’s cool. Bottom line, it’s going to come down to his asking price. If the money makes sense for both sides, a deal will get done. We’ll see. Britton did overall fine work in his short time as a Yankee this past season. If the relationship continues, great. If not, well, baseball goes on.